Graph source: Metro Vancouver report 2016. The B.C. provincial government’s proposed property tax surcharge encroaches onto the municipal tax base. The B.C. take of 40% will increase to 70% and more as it escalates on higher-value properties. This precedent-setting tax grab also makes life less affordable for both owners and renters, so it needs reconsideration. Property taxes are the main source of revenue for municipalities to cover civic services. But rather than using its own provincial tax base, such as the progressive top bracket of income taxes, the government has chosen to impose a new surcharge on property taxes. It is a provincial tax grab of the municipal tax base. Although this is called a school tax, it is not about funding schools since it goes to general revenue. It also is not based on a mill rate. The surcharge is supposed to affect only properties valued at over $3 million, having been strategically set to reduce opposition. However, pressure is already building from some academics to adjust the threshold to $1 million, which would affect the entire city and most of the region. This goes against Canadian tax policy by taxing unrealized capital gains. But once this precedent is implemented, it would be much easier to expand the criteria to capture more properties. Property values have increased across the board, not just at the high end. The reality is that most average people will eventually be affected, not just wealthy property owners. The problem with property taxes is that they are not based on the ability to pay, so in that respect they are regressive. Many of those affected are low-income or average earners, who will be forced into debt or to sell. Deferral is a form of debt that requires a charge on land title to the benefit of the province, but not everyone qualifies. For example, while a principal residence qualifies, rentals of three or fewer units do not. Rental buildings of four units and more are exempt. But all of the houses that have been converted into two or three rental units, or sometimes more if unauthorized, will be forced to have rents absorb that tax increase, to add debt if permitted by the bank to do so, or to sell. For principal residences, owners who are under 55 years of age, or who have no children under 18, will not qualify for deferral either. If owners have other debts, banks may not allow deferral regardless. Deferral cannot be depended upon in the future since the program may be restricted or withdrawn. City of Vancouver property taxes are already the highest in Canada for detached properties based on typical benchmark values for each city. In addition, three-year averaging is no longer applied to most properties. 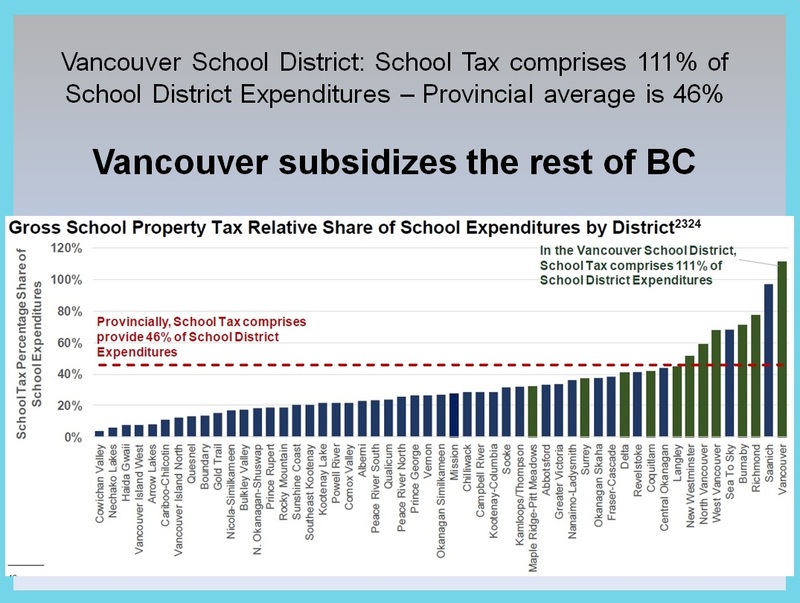 Vancouver pays a disproportionate amount of current school taxes into general revenue. Revenues collected from Vancouver cover 111% of the Vancouver School Board budget, while the provincial average is only 46%. This means Vancouver is subsidizing the rest of B.C. So even though Vancouver and the Metro area already pay more than their share of school taxes, the province is proposing to add this school tax surcharge on top. Since most of the properties affected by the surcharge are located in Vancouver, the Vancouver share will substantially further increase. A number of municipalities have raised concerns with the Ministry of Finance, including the District of North Vancouver, West Vancouver, Richmond and Surrey. But where is the City of Vancouver’s mayor? So far, missing in action – at least publicly. However, we have seen this before. In the 1990s, a “luxury tax” was proposed on properties valued at more than $500,000 by Glen Clark, who was then the BC NDP’s minister of finance, but the idea was withdrawn by then-premier Mike Harcourt when a tax revolt brewed. Harcourt is now urging the government to take a “second look” at its latest surcharge on property taxes and to use the progressive B.C. income tax base instead. Let’s hope the province listens.